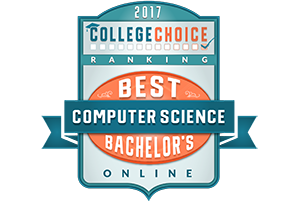 Upper Iowa University has been ranked among the top schools in the nation for Best Online Bachelor’s Degree in Computer Science for 2017. UIU is ranked 30th overall by College Choice, a leading authority in college and university rankings and resources. College Choice stated that UIU’s online bachelor’s degree in information systems provides students the tools to understand both the technical and organizational factors of system infrastructure. Students learn how to use, manage, and implement information technologies to solve real business problems. They similarly gain a working expertise of computing, communications, and software development principles, languages, and methods. Though not strictly a computer science degree, the information systems major can be paired with a computer science specialization. Upper Iowa University offers information systems online, at UIU’s Fayette Campus and through international education centers. This highly dynamic major encompasses the effective design, delivery, use and impact of information and communications technologies in organizations and society. College Choice provides college and university rankings, searches and resources dedicated to helping students and their families find the right college. The site publishes rankings and reviews that make finding the best colleges for different interests easier and more fun, as well as resources to help students get into, pay for and thrive at the college of their choice.